With Thanksgiving around the corner, we at Apartment List are excited for the upcoming celebrations: family time, TV, and turkey (lots of it)! Which made us wonder – how much would rent cost in Los Angeles if we paid with Thanksgiving dinners? 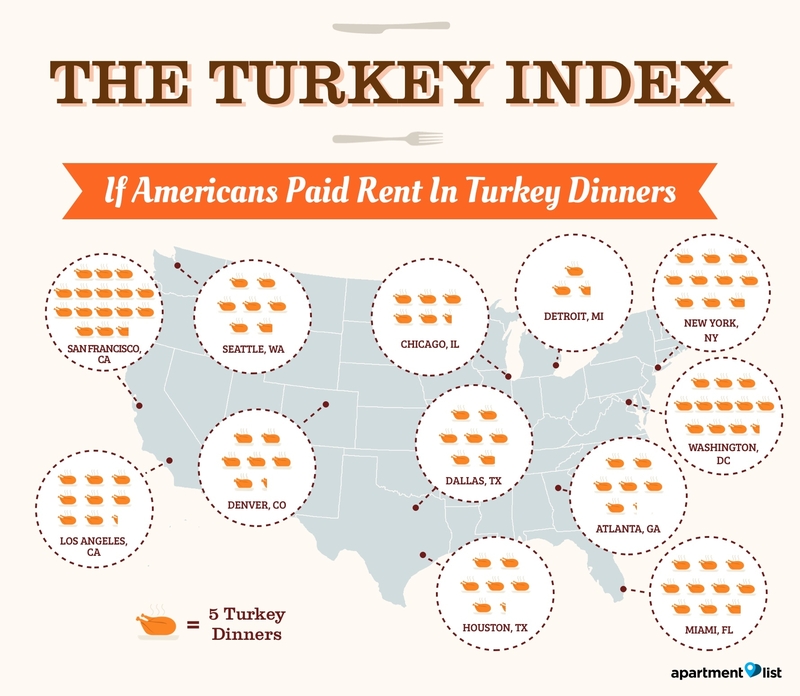 Lo and behold, we present the 2015 Apartment List Turkey Index! To create the index, we used two data points: the median price of a 2 bedroom apartment and the average cost of a Thanksgiving dinner in each city. The rental data was pulled from hundreds of thousands of listings from our website. For the Thanksgiving dinner, we used the average prices of a Thanksgiving dinner ($50.70 when you include turkey, stuffing, mashed potatoes and pie), and adjusted the prices for each city using the grocery component of a cost of living index. Finally, we divided the 2 bedroom price by the average cost of a Thanksgiving dinner to get the Turkey Index. Looking at the data, we see that there is substantial variation in turkey dinner rents across cities in the United States. LA renters have to pay roughly 41 Thanksgiving dinners to pay one month of rent. That’s nearly 1.5 Thanksgiving dinners per day! New Orleans (35) follows closely behind, with San Jose (41), San Diego (35), and Dallas (34.5) among the more costly cities. At the other end of the spectrum, renters in the nearby California city of Bakersfield can expect to pay just a little over 14 Thanksgiving dinners to their landlords this November. Not too bad when you compare that to other California cities such as San Francisco (78). If you’re interested, we’re including data for 88 cities across the United States. Check out the table below to see how other cities compare– and have a great holiday celebration! Andrew has lived in 13 different apartments in the past six years. He currently is a Manager of Growth Strategy at Apartment List, leading research on rental market trends and renter satisfaction. His interests include cycling, cooking and tennis.